Choralfest USA, the first of what its founder and Artistic Director, Harold Rosenbaum hopes will be an annual event for many years to come, was indeed splendid. 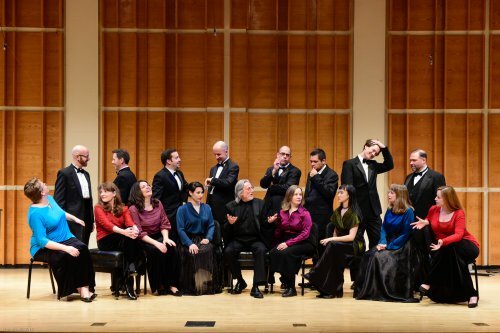 Over a period of six hours, on an early summer afternoon and evening at Symphony Space, twelve choruses gave “mini-concerts” of 15 – 25 minutes, following one another with little break except an emcee’s brief, efficient and entirely cheerful introduction of the next choir. Each group of singers performed pieces that, in one way or another, represented that particular group’s identity. Some groups, by their very nature, commit themselves to just one kind of music – music for men, or for women; Jewish music; inspirational songs; contemporary composers’ works – though a closely circumscribed repertoire rarely limits the breadth and richness from which choral directors can choose works to perform. Part of Choralfest USA’s purpose, in fact, is to celebrate this richness. For this initial event, Rosenbaum as Artistic Director and Edie Rosenbaum, Rosenbaum’s wife and creative partner, and Choralfest’s Managing Director prescribed that the music presented should extend from Aaron Copland to the present. Within this chronological expanse, individual pieces were chosen from sacred music, folk music, show tunes, settings of Shakespeare and other poets, traditional songs and several selections of the music of Randall Thompson, whose magnificent 1940 Alleluia would conclude the concert. The Empire City Men’s Chorus sang “The Pasture” from Randall Thompson’s Frostiana; The Canticum Novum Singers sang “The Road Not Taken” from that same work. Ghostlight Chorus, fresh from their third place European win in the fourteenth annual International Chamber Choir Competition Marktoberdorf, sang Randall Thompson’s ravishing 1936 The Peaceable Kingdom. In general, the choirs performed as groups, though occasionally a soloist was featured as in the New Amsterdam Singers’ Ain’t Got Time to Die (Hal Johnson, composer) and The Canticum Novum Singers’ The Same Train (David Lang, composer). Most songs were sung a cappella though a few were accompanied on piano. All together, the twelve choirs – Angelica’s Women’s Chamber Choir, Zamir Chorale, Riverside Church Inspirational Choir, Voices of Gotham, Chameleonic, Connecticut Chamber Choir, Empire City Men’s Chorus, Ghostlight Chorus, New Amsterdam Singers, C4: The Choral Composer/Conductor Collective, The Canticum Novum Singers, The New York Virtuoso Singers – presented works by close to fifty composers and arrangers. Styles and moods careened with dizzying speed from elegance to intense spirituality, from accessibility to mysterious puzzle, from sensuous seduction to funky fun, but throughout the diverse performances, a single spirit of dedication to excellence prevailed. Enthusiastic and brisk emcee Mukund Marathe introduced each choir. He provided in mere minutes useful facts about the upcoming choir and the works they were performing. The information was invaluable, but it was barely enough: for every chorus, even more information would have been desirable. Whether or not the kind of detailed printed program typically produced by choirs such as The New York Virtuoso Singers or C4 for their full concerts can be produced for this large number of choruses is difficult to know. For many pieces, familiarity with their background and context substantially increase the audience’s enjoyment of the music. All the choirs were at their best, presenting music they clearly loved. Singers arrived at Symphony Space early to listen to the groups before them and stayed on to hear the choir after them. Almost every member of the audience had a personal connection of one sort or another with a singer or a choir … or the experience of choral singing. For the brief three or five or six minutes of each individual song, the atmosphere was like that of any formal concert: attention was fully focused on the singers and the singing. But in between, there was an atmosphere of relaxed conviviality. Friends and acquaintances waved hellos to each other from different sections of Symphony Space, or exchanged quick hugs, catching up on news. The sense of a shared commitment to choral music and, especially, to the interconnected joys of both singing and listening created a palpable spirit of happy delight that informed all six hours of music. Audience members came and went at will; some stayed only a short time while others could be heard telling friends or acquaintances at 8:00 that they’d been there since 3:00. As the evening came to a close, just before The New York Virtuoso Singers, the last choir, performed four songs, many singers who had sung earlier in the afternoon or evening reappeared in the hall. They carried with them neat, clean scores which they distributed to the audience immediately after The New York Virtuoso Singers’ last song, Edward Smaldone’s difficult and beautiful L’Infinito. Rosenbaum then led the assembled crowd in the singing of Randall Thompson’s Alleluia. Rosenbaum conducted us all – audience, singers from many choirs and The New York Virtuoso Singers – from the stage, beating the work’s rhythm clearly and indicating dynamics expressively and encouragingly. Altogether, it was a very fine group sing; after the last note, exhilaration prevailed. Even towards the end of the six-hour event, when the best known choirs were performing, the audience was much smaller than it should have been. It’s hard to know why the audience was as small as it was, but next year’s should be bigger. Time and date are already planned. 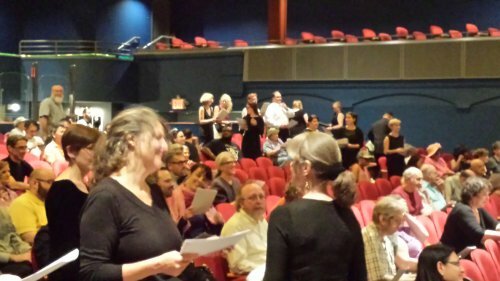 If the project’s identity as a celebration of both American choral music and of the extended, generous creative community of choral singers and directors can become associated with the spirit of welcome and inclusion that characterize both Symphony Space’s programming and the Upper West Side, then the audience will grow in both size and enthusiasm. Rosenbaum is an important leader in American choral music; his multiple accolades are well deserved. In his description of Choralfest USA’s mission on the Hatchford fundraising website, Rosenbaum set out his Choralfest USA goals. Rosenbaum wrote, “Our hope and dream is to give choirs public exposure in an important New York City venue, to inspire choir directors to explore the vast repertoire of American choral music for future concerts, and to instill and reinforce a love of American choral music to (sic) audience members” (www.hatchfund.org). If its June 2015 debut is an accurate indicator, Choralfest USA is indeed a promising program: if anyone can both expand the choral music community’s spirit of collaboration and present the example of that collaboration to other creative communities, then Rosenbaum, working closely with his wife and creative partner, might indeed be the person to do it. 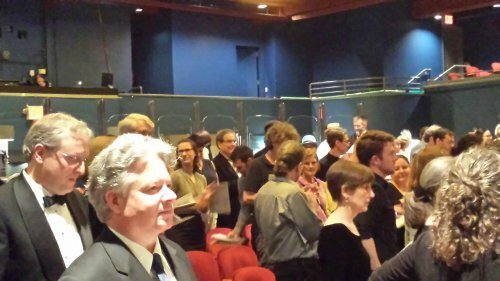 The next Choralfest USA will take place at Symphony Space on June 4, 2016; Peter Schickele will be the special guest. It should be a wonderful event. Wonderful program, i wish I had been there. As a choral director for 45 years, this type of multi resource concert is what should ignite the choral and instrumental music educators at all levels. KEEP IT UP, I want to ignite this program here in Phoenix!